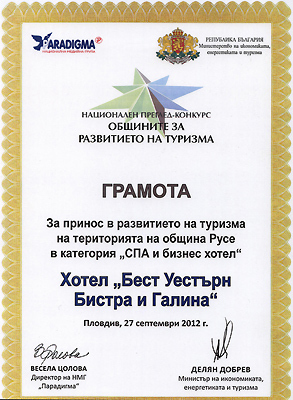 On 27th of September 2012 - the World Tourism day, Bistra & Galina Hotel received its consecutive acknowledge - Award for contribution in the development of tourism in the region of Ruse municipality, category “Spa & Business hotel”. The prize was presented by Ministry of Economy, Energy and Tourism and National media group “Paradigma” at National review – competition “The municipalities for the tourism development”. The hotel is winner of 6 more national and international awards for the service quality. Situated in the very centre of the city of Rousse, the “Bistra and Galina” Hotel is in the immediate proximity of all known administrative, commercial and cultural institutions of the city. The wonderful location of the hotel – a few minutes’ walk from the renowned “Profitable House” and the beautiful city gardens - make it equally attractive both to business visitors and tourists. The first four-star hotel in Rousse is the only representative in our city of the biggest hotel chain Best Western, whih guarantees uniform standards and high quality of services offered anywhere in the world. The combination of modern facilities, comfort and cosiness, as well as excellent conditions for business and recreation make it especially attractive. The “Bistra and Galina” Hotel has proved that in the world of hospitality quality services, fine style and pleasant surroundings make only for part of the four-star attraction. The professionalism of the staff, the lively atmosphere and the impeccable cleanliness are the trade mark of the hotel. The guests receive personal attention from an affable staff. Few are the urban hotel complexes that can combine the possibilities for business downtown, a rest in the most beautiful garden of Rousse and relaxation and sport with modern SPA procedures and equipment. As an architectural conception the hotel abounds in light, greenery and colours which change its atmosphere according to seasons. Business services, a conference hall, room service, panorama lifts, an underground parking lot with a warm connection comprise only part of the conveniences which warrant for the peace of mind and the security of the guests. People of business choose this hotel complex for the modern conditions for work, seminars and meetings, as well as for the good possibilities for business lunches and dinners in the elegant interior of the “Regal” restaurant. Tourists make their choice of the “Bistra and Galina” Hotel because they are certain of faultless reservations and information provided about events and landmarks in the region, as well as the possibility to organise interesting cultural routes. Regular guests of many years know something more which charges them with optimism and the hope that the good people can change the world for the better. 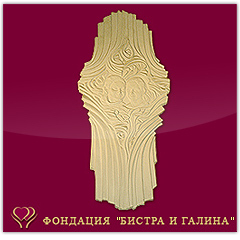 The “Bistra and Galina” Hotel Foundation is the only one of its kind established to raise funds for charity work. The activities of the Foundation team with numerous successful projects, donations and sponsorship addressed at talented children and young people, as well as underprivileged ones, set a laudable example. So do the projects in the sphere of Rousse’s cultural heritage and arts. International Award for Quality "ERA"
International Award "The Arch of Europe"